Escape being typecast. If you’re trying to expand into other industries, skill sets, or media types, you need to take chances—and you need clients who are willing to take a chance on you. Obviously, you don’t want to get in over your head, but there’s nothing wrong with being a little uncomfortable while you’re learning something new. I’ll bet you $100 this can also help alleviate impostor syndrome when you pull it off. Build your reputation as someone who gets it done. This is essential for loyal clients and a valuable relationship-builder for newer ones. Big, difficult, and emergency projects—priced appropriately and assuming they’re physically possible—are the perfect opportunity to create an indelible brand image. Think of it from the client’s perspective. Expand your network. It’s easy to say no to the time and, in some cases, expense of conferences, professional associations, local groups, and even meeting someone for coffee. I had a meeting on Wednesday night for a volunteer group, so the last thing I wanted to do Thursday night was “saying yes” to a networking meeting with some local freelancers. But guess what: I connected with a potential client, learned about a conference I might pitch as a speaking gig, and ran into an old friend I hadn’t seen for a while. Boom. Reset your mindset. Based on my own experience, I would argue that the most important time for saying yes to freelance jobs is when you least feel like it. (Yes, your experience may differ!) I’m an optimistic, positive guy, and succeeding under challenging circumstances reinforces my belief in the default-yes principle. The extra checks ain’t bad, either. There are plenty of great articles about saying no to freelance jobs out there, and I’ll leave it to you and your Google-fu skills to find them. Again, this isn’t about letting down your defenses and saying yes to everything, but being open to possibilities to grow yourself and your business. Even “yes, but…” is a stronger position than a reflexive no. The universe might just surprise you. I’m pleased to announce I’ll be speaking at Startup Week PHX in downtown Phoenix on Monday, February 19, 6-7 p.m. local time. (Event details here.) My presentation will include tricks and tips for finding talented writers, designers, and other creatives; how to vet prospective freelancers; and best practices for cultivating better relationships. Although my session is aimed at helping people hiring independent creatives, I imagine the overall event will be a networking opportunity for local freelancers. I’m also doing mentoring sessions at 2 p.m. and 2:30 p.m., and will be available before or after to talk shop. So stop by to say hi! 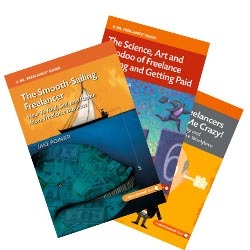 If you’re interested in improving the financial side of your freelance business, please join me for my Editorial Freelancers Association webinar, “The Pricing (and Estimating) Is Right!” on Wednesday, February 14, 1-2 p.m. (Eastern). I’ll address the critical steps of formulating your price structure and presenting your estimates in the most persuasive manner possible—and getting a better read on whether you should be saying yes or no to freelance jobs—and there’s a Q&A if you’ve got pricing issues you want to discuss. That’s it for now. Don’t forget to say “yum” once in a while! I’m glad I’m not the only optimistic type among freelancers! 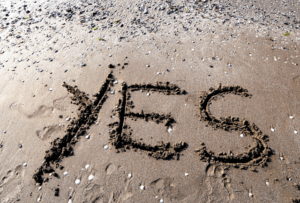 I’ve always been a big believer in saying yes and figuring out how to make it work even when coping with current deadlines and demands on my time. If you say no too often, your business could grind to a halt. When I do say no, it’s for a good reason – and often only after saying maybe first and confirming that a potential project pays too little, has an impossible deadline, involves someone difficult to work with, is outside my skillset or interests, etc. Concur 100%, my friend. Thanks for commenting! Yes! In my first year as a freelance editor, everyone said I should have a business plan. I couldn’t see why it was necessary, except as a way to keep investors happy. At the time, I was the only investor, and I already owned a computer, a dictionary, and a red pen. I had to spring for a style guide ($60+ for CMOS!). As the sole investor, I decided my plan was to keep ME happy. Still, I wanted to start my business with a written plan. I wrote it in one word: Experiment. And printed it out. And posted it next to my computer. I didn’t say no to anything in the first year or two. I just experimented and learned lots about where the rewarding work would take me. It took me into publishing, but not the kind that most editors think of. My “publishers” are companies that publish thousands of pages every month, in the form of proposals and reports to clients. Follow the work that rewards you in some way. In experience, at first. In financial terms. And in the great satisfaction of knowing that you’re becoming a better editor with every project. That’s a fantastic story, Virginia. I’m a huge fan of experimenting, and your business plan sounds rock solid to me! Thanks for commenting. I’ve been upfront and honest about my lack of experience when discussing potential jobs, and that seems to make potential clients want to work with me even more. So sometimes my “I’m not sure this is going to work out” (bordering on no) transforms into a yes because someone thinks I’ll be a good fit despite my uncertainty. So I take the job, learn from it, and file it as another skill in my repertoire. And I don’t generally say “no” to decent projects until my calendar is already crying “Uncle!” and begging for mercy. Hi Vicki! That’s an interesting dynamic, isn’t it? And, yes, you always need to know your “uncle” point 🙂 Thanks for commenting. Jake, this week I’m saying yes to a four-hour time sink. Why? Because it’s a new client, and the best way to really cement the relationship is to build a face-to-face bond. My opinion only, but when they ask you to meet the team, you damn well should meet the team. That’s my opinion as well. I know a lot of people have an aversion to F2F and even phone calls, but it takes what it takes.